Ford will add a Fiesta Vignale variant in Europe with upmarket features including large alloy wheels and a hexagonal front grille. COLOGNE, Germany -- Ford of Europe is adding upscale and crossover versions of its new Fiesta, along with advanced safety technologies, to boost the car’s competitiveness in the tough subcompact segment. Ford unveiled the new-generation Fiesta at its European headquarters here today. The Fiesta will go on sale in Europe next summer. The U.S. version is expected to launch in 2018. "Our next-generation Fiesta will deliver an option for every driver -- from downsizing customers who want big-car quality in a small car package, to growing numbers of crossover consumers," Ford of Europe CEO Jim Farley said in a statement. Ford said the new Fiesta has the most sophisticated range of driver assistance technologies and connectivity features offered to date in a volume small car in Europe. It has technology that small-car customers "could only have dreamed of just a few years ago," Farley said. • Enhanced pedestrian detection technology that can help prevent collisions at night by detecting people who are in or near the road ahead, or who may cross the vehicle's path. • A parking assistant that helps drivers find suitable spaces and park hands-free nose-to-tail and side-by-side with other cars. It can also apply the brakes to prevent low-speed bumps if drivers do not respond to system guidance and proximity warnings while maneuvering. • A "Cross Traffic" system that warns drivers reversing out of a parking space of vehicles that may soon be crossing behind them. The Fiesta, which will have three- and five-door variants, has grown in size to distance it from Ford’s new Ka+, which targets European customers seeking budget cars. At 4040mm, the Fiesta is 71mm longer than the current car. It is also 21mm wider. Registrations of high-specification subcompact models have grown 24 per cent year-on-year while demand for entry level models has grown 11 per cent, Roelant de Waard, Ford of Europe’s sales and marketing chief, said in the statement. Ford now offers a "greater choice" for subcompact segment customers, he said. While the Ka+ battles in the lower regions of the segment, Ford has added upscale styling and interior features to the Fiesta. For a more premium look the car now has parking sensors flush with the body panels. The shut-line between the roof and tailgate by has been reduced by more than 30 per cent and road noise is reduced by seven per cent, Ford said. The Fiesta’s top model will be the Vignale version and it extends the brand’s premium trim into subcompacts for the first time, joining the Mondeo, S-Max, Kuga and Edge Vignale models. Upmarket features include 18-inch alloy wheel designs, quilted leather seats and a hexagonal front grille. High-volume carmakers such as Ford have for several years been squeezed in a downmarket expansion by luxury rivals including Mercedes-Benz and Audi. Ford now wants to take further advantage of the desire of some customers for upscale cars. "Having that kind of special feeling in a mainstream product is where the market is going and where Ford as a brand needs to go to make money in Europe," Farley said. "We don't want to build commodities anymore." Farley declined to say what contribution to profitability the new Fiesta may make. 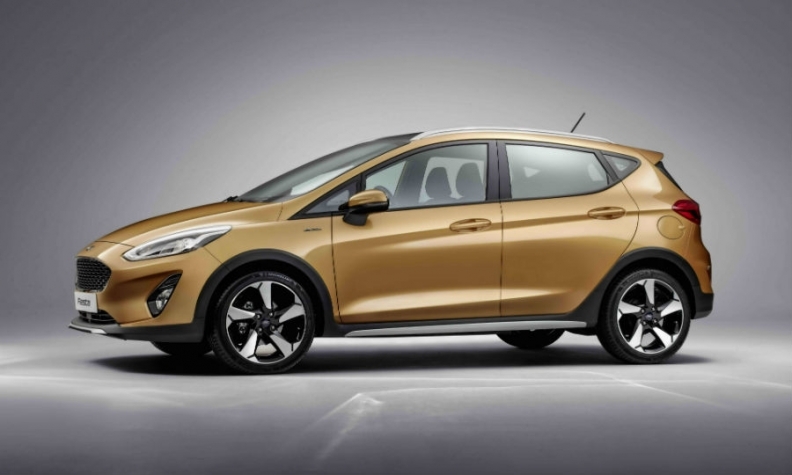 The Fiesta also will have a new crossover-styled variant named Active, which will be the first in a new lineup of Active vehicles to be rolled out across the Ford range. The Fiesta Active has SUV-inspired styling that includes raised ride height, roof bars and additional body cladding. The Fiesta Active has a raised ride height, roof bars and additional body cladding. The Fiesta will also have an ST-Line model that takes its styling cues from a likely future ST sports version to include a rear spoiler, sports seats and a stiffer suspension. Other model trims include a Titanium model with a unique front bumper and grille. Launch models in Europe will come with a choice of three versions of Ford’s 1.0-liter three-cylinder EcoBoost gasoline engine, with the most powerful delivering 138 hp. A new six-speed manual transmission and active grille shutters cut CO2 emissions to 97 grams per kilometer. A 1.1-liter naturally aspirated version of the EcoBoost engine replaces the 1.25-liter entry gasoline unit. The Fiesta will also offer a 118-hp 1.5-liter diesel, the highest powered diesel Ford has included in Fiesta’s engine range to date. An 84-hp diesel will also be offered with 10 hp more than the current equivalent engine and CO2 emissions of 82g/km. 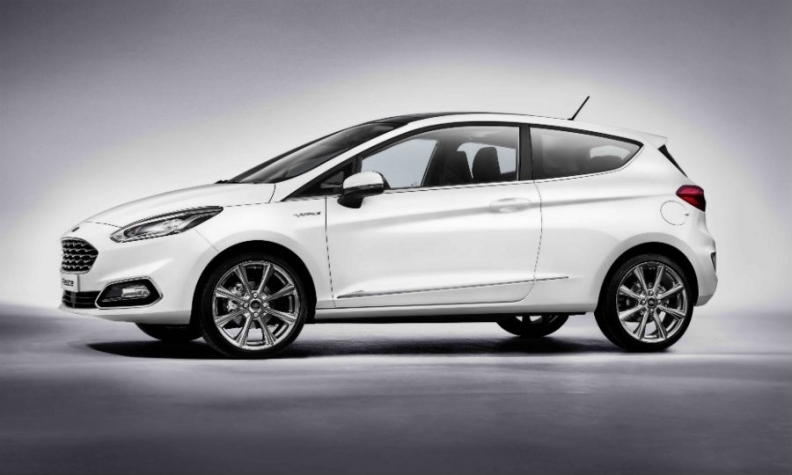 The Fiesta will continue to be built for European sales in Cologne, Germany. It uses an updated version of the platform used by EcoSport small SUV and Ka+ hatchback. Pricing is likely to stay competitive with that of the current car, a Ford spokesman said. However the Fiesta’s starting price has increased because Ford has dropped Fiesta’s two entry trim levels to make way for the new the 10,000-euro ($10,644.00) Ka+, which competes for subcompact customers like the Fiesta after moving out of the minicar segment. The Fiesta is Ford's top-selling passenger car in Europe and was the second best-selling subcompact car in the region through October after the Volkswagen Polo with sales of 253,180 through October (down 5.8 per cent), according to data from JATO Dynamics market researchers. Sales of the vehicle have fallen in Canada, where the automaker has sold 2,771 in the first 10 months of 2016, down from 4,746 in the same time frame a year ago.